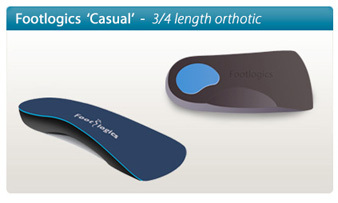 Research has shown that some simple daily exercises can assist greatly in the relief of Plantar Fasciitis. Below are the exercises prescribed mostly by podiatrists and physiotherapists in Australia. IMPORTANT: Stretching exercises should create a pulling feeling, but they should never cause pain! We recommend you do these exercises first thing in the monring and again 2 or 3 times during the day, but you don't need to do them all at once. If these exercises, combined with wearing an orthotic do not provide any relief from your Plantar Fasciitis pain, you should consult a podiatrist. After these exercises, put on your shoes (with orthotics inside them) or wear supportive sandals. Do not start the day walking barefoot on hard floors or tiles, or your heel pain will return. This exercise will help make the Plantar Fascia (ligaments under the foot) more flexible. Usually after sleeping the Plantar Fascia tighten and shorten during the night, causing Plantar Fasciitis pain with your first steps out of bed. Use a tennis or golf ball (or rolling pin). While seated roll the ball with the arch of your foot back and forth from the heel to the ball of the foot. If this feels okay and doesn't hurt you can progress by doing this exercise while you are standing up. Keep rolling the ball for about 4-5 minutes. 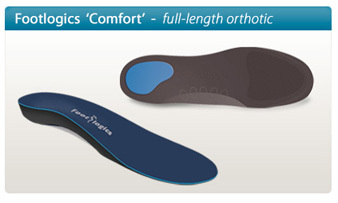 This is an excellent exercise to make the plantar fascia more flexible. Roll a towel and place it under the ball of your foot, holding the towel at both ends. Gently pull the towel toward you while keeping your knee straight. Hold this position for 15 to 20 seconds. Repeat 4 times. Tight calf muscles are a major contributing factor to problems in the heels. Flexible calves will assist with reduing the tension on the plantar fascia. Stand facing a wall with your hands on the wall at about eye level. Put the leg you want to stretch about a step behind your other leg.Keeping your back heel on the floor, bend your front knee until you feel a stretch in the back leg.Hold the stretch for 15 to 20 seconds. Repeat 4 times. Tight Achilles tendons also contribute to heel pain. Stand on a step as shown below. 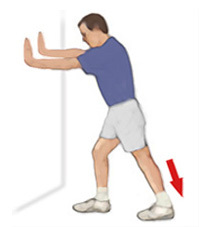 Slowly lower your heels over the edge of the step and you'll feel a strong pull in the Achilles and calves. Please hold the stretch for about 20 seconds, then bring your heels back up to the level of the step. Repeat this exercises 4 times.